1246 lbs. (565 kg) with ATV tires, 1257 lbs. (570 kg) with HDWS tires. The CVT Plus is virtually worry-free. An exclusive Inertial Clutch keeps the thick, double cogged-belts tight for minimal slippage that results in greater response and better durability than competitive belt-drive systems. As an additional Plus, this clutch provides noticeable dynamic braking to help maintain control during descents with engine-assisted deceleration. The CVT Plus also has a full protection cover that minimizes mud or dust intrusion, enhancing durability and enabling a longer belt life. 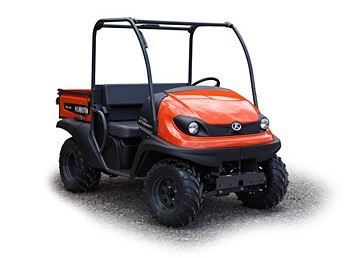 A new high-revving 16 hp air-cooled single cylinder gasoline engine was selected to meet Kubota;s stringent performance specifications and durability requirements. This engine also features an electronic fuel injection (EFI) system, helping to eliminate cold starting issues and annoying manual choke adjustments that plague competitive carbureted utility vehicles.